A quickie post on online manners … how well do you look after your new followers, retweeters and favoriters on Twitter? Do they just receive a banged-out autoresponse that fools no-one in its insincerity? Or do they get the feeling that maybe – just maybe – a real person might have written this message of acknowledgement? …but as so many of us who are running small businesses are not huge corporates, we can take advantage of our lean flexibility and use that to communicate at a genuinely personal level that the corporates could only dream about in realistic terms. If you have a cast-iron brand that secures you a top-banana position in your field of business, no-one would expect you to tweet individually to interested parties. But for the thousands – if not millions – of SME businesses using Twitter for our commercial purposes, ignore what your social media consultant / staffer / intern (as so many of them are…) might say. 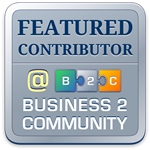 Thank, share, tweet, link and chat as the person behind the business. It’s well known that people prefer to do business with someone they feel they know and trust. Which would you trust more? An autoresponder that quite obviously doesn’t know who the hell you are? Or a real person who uses your (properly spelled) name in the tweet and says something that’s truly meaningful to you? With eternal gratitude to the estate of Norman Thelwell, who kindly granted me permission to share this priceless drawing of an extremely rude pony.